Another hip Kimpton establishment, Donovan House resides in the midst of Fourteenth Street’s buzz of trendy bars, eateries, and nightclubs. This is the place to stay if you’re young (at heart) and looking to keep your pulse on downtown’s latest scene. 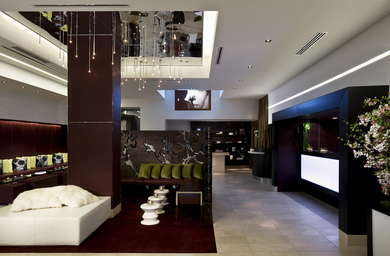 The hotel itself is stylishly metropolitan, with a chic rooftop pool and bar and acclaimed Asian restaurant. The White House and the National Mall are an easy walk away. YOU SHOULD KNOW A daily facilities fee of $21 plus tax is charged, which includes upgraded WiFi, local and long-distance calls, and shuttle service within a mile. 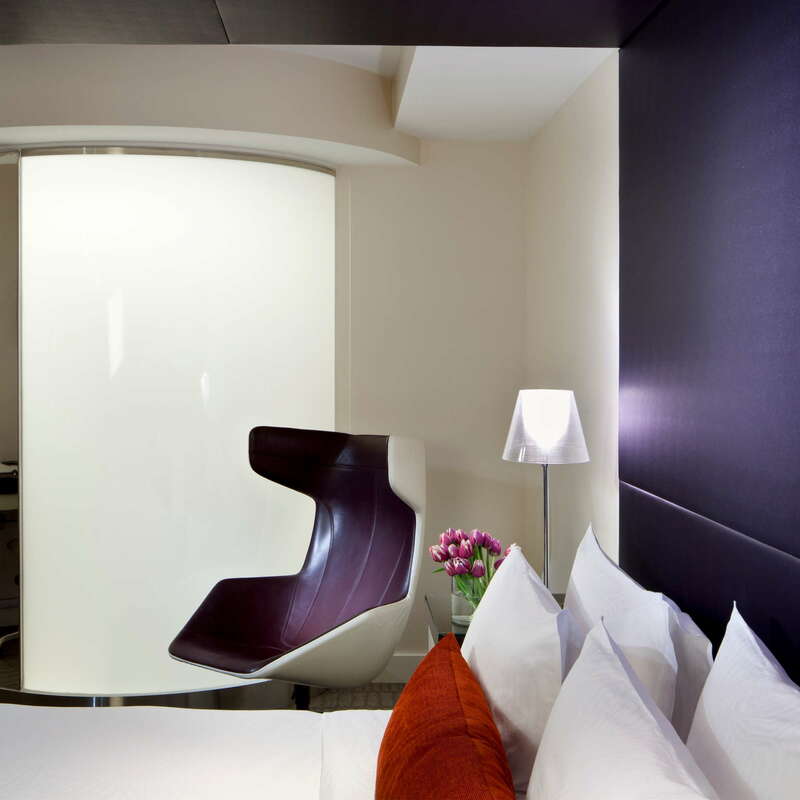 Leather canopy beds and modernist chairs add the perfect verve to a minimalist room that’s all about urban chic. As hip as they look, the rooms are functional too, with dark oak desks providing a comfortable work space, substantial lounging stations, and oversized TVs. And, of course, every room includes the signature Kimpton Frette sheets, animal-print robes and yoga mat. Floor-to-ceiling windows provide romantic city views. For the business minded, ten of the King Suites include an oak-finished executive table with gold-winged chairs that can seat up to six people for a meeting. The bathrooms are modern and elegant, with bright white tiles, animal print robes, and Keihl’s bath products. But it’s the spiral walk-in showers that catch our attention the most. The urban chic theme strikes the minute you enter the lobby, with its strand lighting, banquette seating, and color theme of white, olive-green and deep purple. This is a place to meet a friend for a drink, or simply to lean back into a pillow and linger awhile from your perfect people-watching perch. The rooftop pool, with its stunning view over DC's rooftops, is open Memorial Day through Labor Day. Only guests can lounge and splash, and enjoy snacks and drinks from Zentan. At 4 p.m., however, the oasis transforms into the DNV Rooftop Bar, when the pool closes and the bar transforms into one of the neighborhood's buzziest venues. 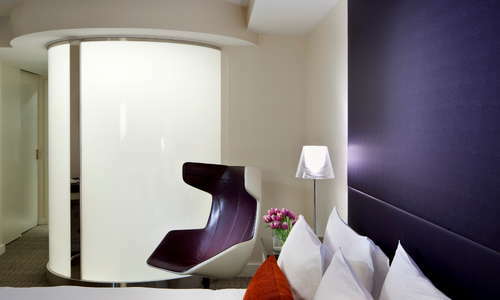 Massages, facials, and other services can be enjoyed in the privacy of your room. There's a small fitness center, open 24 hours a day. And don't forget the yoga mats in every room. At Chef Yo Matsusaki’s acclaimed Zentan you’ll gather around a communal table and dine on small plates created on the custom-built robata grill and/or sushi shipped straight from Japan’s Tsukiji Market. The selection of Japanese whiskeys is especially tempting. Imbibe in happy hour cocktails and Asian-inspired small plates while taking in stunning views of DC from the rooftop DNV Rooftop Bar. 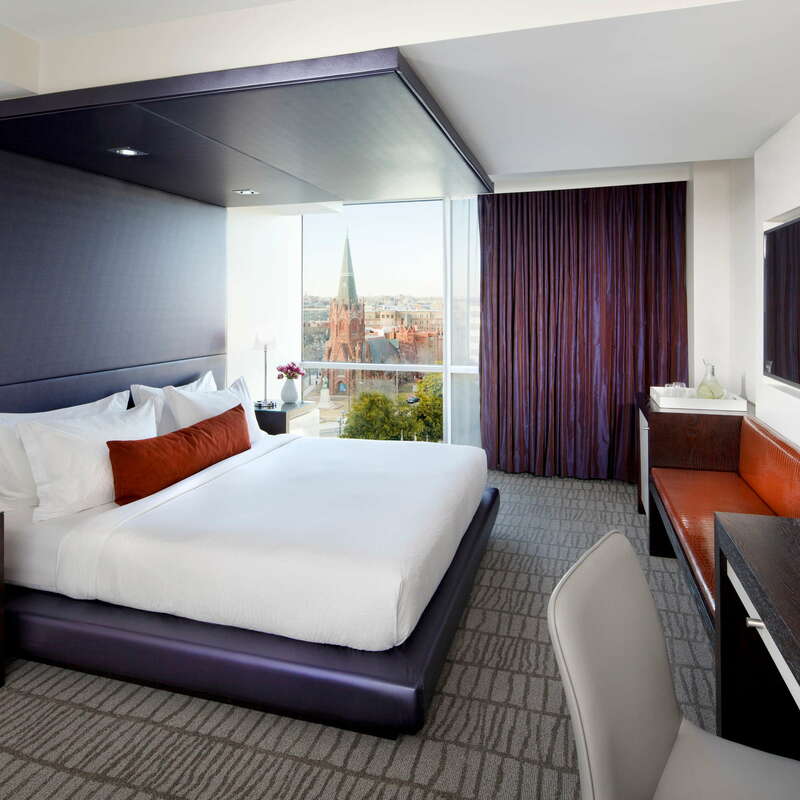 The Donovan sits on Thomas Circle, with some of DC’s trendiest bars, excellent dining options, and nightclubs—as well as the White House and National Mall—within easy walking distance. You definitely won’t want a car in this congested part of town; and there’s really no need. If you want to go farther afield the McPherson Square metro stop is a 0.4-mile walk away. The Pig is an Americana-decorated eatery highlighting pork, with plenty of creative surprises (bacon-covered peaches, for example). Georgia Brown’s is an upscale southern fare including some of the best gumbo around. It's a favorite Sunday brunch spot. ChurchKey is casual and crowded, with 555 hand-picked craft beers and American bites in what many consider to be the beer bar in town—if not the region. Barcelona Wine Bar has Spanish tapas and wines in a rustic setting including an outdoor patio centered around a firepit. We can’t lie--we love this super-hip hotel for being right in the middle of things. On warm summer evenings, the rooftop pool bar is the perfect place to sip handcrafted cocktails (including frozen caipirinhas, punch, and sangria available in a tower-like container with a tap that serves up to 10). Or you can step right outside the front door to partake in some of DC’s buzziest restaurants and bars. The service is impeccable, and the Kimpton perks are always a plus. And you can never go wrong with the Dean-and-DeLuca-stocked minibars. #1 The Best Hotel Rooftop Bars in Washington D.C.
#6 The Best Pet Friendly Hotels in Washington D.C.